SMPlayer is a free media player for Windows operating systems and Linux that uses the free media engines MPV and MPlayer for playback. Like most media players nowadays, SMPlayer ships with built-in support for many popular and even lesser known video and audio formats so that it does not rely on installed codecs for playback. Apart from great support for different formats, SMPlayer ships with a set of features such as YouTube support, automatic playback resume, or options to download subtitles that you won't find in many other players. 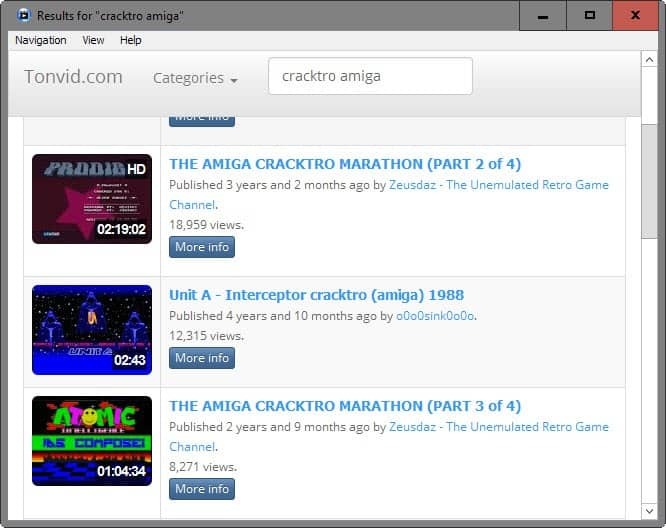 SMPlayer is offered as a portable version for 32-bit and 64-bit versions of Windows, and as a version that needs to be installed. The program shipped with third-party offers previously when you installed it, but that does not seem to be the case anymore. At least, no offers were presented during test installations. If you want to be absolute certain, download the portable version instead. SMPlayer supports all major formats right when you run it as it ships with codecs for them. This includes formats such as avi, mkv, mp4, mov, wmv, divx, mpeg, flv, or mp3. In addition to support for these formats, it supports CD and DVDs that you can play using the program as well. An optional uncommon codecs package was offered previously for the player but that is not offered anymore. You can play video or audio files by dragging and dropping them into the player interface. Alternatively, you may use the open menu to load local files, discs, net, entire directories, playlists or urls. This means that most forms of playbacks that you will encounter, with the exception of casting, is supported by the program. If this is your first time using the media player, you may want to check out the options to configure some settings there. The preferences may overwhelm you at first as they provide you with a truckload of options.Open the preferences with the shortcut Ctrl-P, or by selecting Options > Preferences. General > Multimedia Engine enables you to switch between MPlayer or mpv as the media player used by SMPlayer. 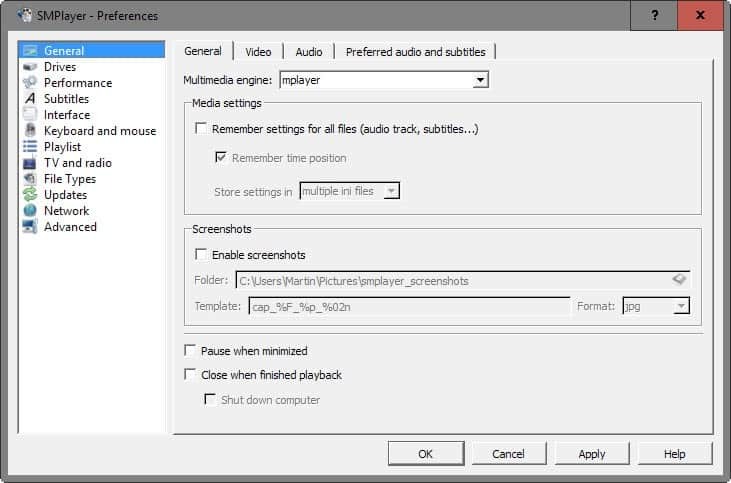 General > Remember settings for all files will remember subtitles, audio tracks, and the position the video was stopped the last time. Subtitles > Autoload defines the subtitles, if any, that are loaded automatically by the player. Interface provides you with options to change the gui, icon set and style. Other options there include whether you want the player window to be resized automatically based on the resolution of the video, seeking jumps, and how many recent files and urls you want the player to remember. Keyboard and mouse displays shortcuts, lets you edit shortcuts, and define mouse and mouse wheel functions. SMPlayer maps different functions to the mouse wheel by default which is different from VLC and many other players which map the volume to the mouse wheel instead. There is more to it than that. There is an advanced section, and preferences to define updates and network usage. The media player works for the most part just like any other. You have playback controls, can jump to any part of a video right away, or switch between audio tracks and subtitles easily. But there is functionality that is less common, and it makes sense to look at it more closely. Set two markers at different positions of a video, and enable repeat, to play this part over and over again without having to play the whole movie or seeking to the right position all the time. You can change the playback speed of media using the Play > Speed menu or by using shortcuts. This can be useful to speed up or slow down playback of video or audio files. SMPlayer offers plenty of options when it comes to manipulation of the play area. You may zoom in and out, change aspect ratio or size of the window, or rotate the screen. Other features include filters, a mirror mode, Stereo 3D filter, and a compact mode. All options are listed in the video menu, and accessible from the right-click menu and keyboard shortcuts. 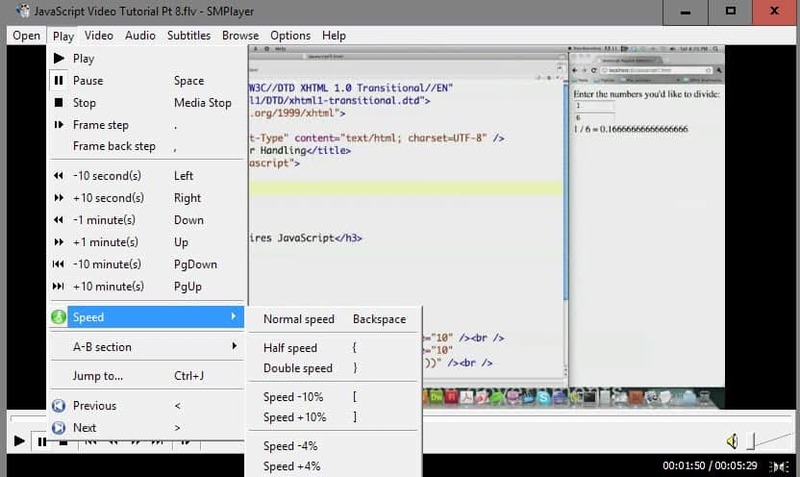 You need to download the component separately but it integrates with SMPlayer afterwards. Basically, what you get is a search component that returns videos hosted on YouTube, and an option to play these videos using SMPlayer. I use the media player as a secondary player on Windows machines -- the first is VLC Media Player -- as it players some formats, some large WMV files for instance, better than VLC. In addition, I like the YouTube player it ships with, and that it remembers the playback position so that you start there if you reload the video at a later point in time. 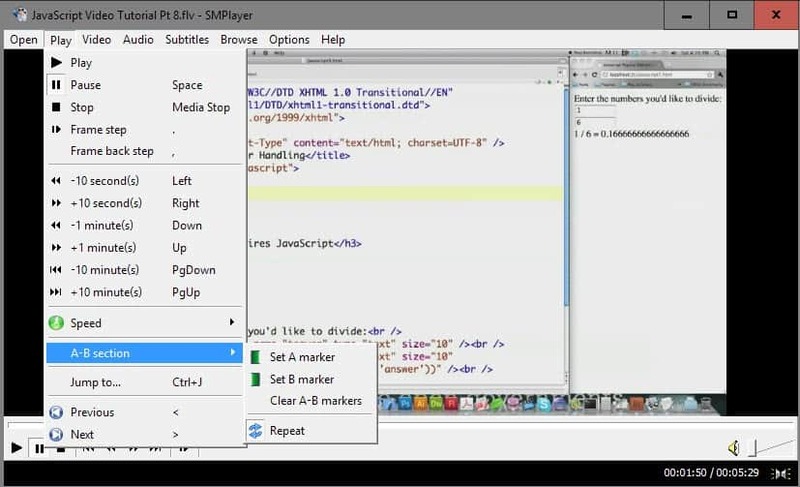 SMPlayer is a powerful media player for the Windows operating system and Linux. It is open source, and on Windows available as a portable version. The player plays nearly any video or audio format you throw at it out of the box, and supports many other features that provide you with options to change playback in one way or another, or use extra features like the ones mentioned previously in the review. The Windows installer includes mpv now so that you can switch between both engines right away. You can load VLC's keyboard and mouse shortcuts profile if you prefer that. Option to select preferred quality under Preferences > Network for streaming video. I want to like more SMPlayer than VLC but the first one’s subtitles are rendered in a lower quality. There doesn’t seem to be an option to make them look better. And I so enjoy SMPlayer’s interface a lot more. Have you experienced anything similar between the two regarding the subtitles? Using SMPlayer for last couple of years, very pleased with it, subtitles finding is a must have for me. Haven’t updated it because of the bloatware that was offered with install file but will try to do it after your article. I’ve used almost every major video player on the market for the past 10 years like VLC, Potplayer, Daum, MPC, Plex, GOM, etc… and SMP is easily my most used fave. In truth, almost all players do basic playback equally well. The differentiating factor comes down to how fast it loads up, how taxing is it on system resources, and who has the most convenient features. Here’s my current usage breakdown and why in order of usage. #2 – MPC-HC: I use it exclusively with Twitch Livestreamer. Twitch’s browser video rendering absolutely trashes CPU especially when you are watching a 60 FPS 1080p stream with lots of movement at Source setting so Livestreamer is a must. You can even watch past broadcasts with a very simple command line shortcut – this is where MPC-HC comes in. SMP and MPC can both play past broadcasts but of the two, only MPC handles the command line argument that lets you seek (ie. lets you jump to different points in the video). With SMP you can only play a Livestreamer video from beginning to end. The reason I don’t use MPC as my main is because the interface is not nearly as efficient as SMP for everyday use or YouTube. #3 – VLC: I use this when nothing else works. VLC is a beast at handling everything including older codecs and malformed or corrupted video headers. The reason why I don’t main VLC is because it is super slow to load up, is slightly more taxing on system resources, and also doesn’t accept the command line argument for seeking in Livestreamer. 2) Change your interface to the visually mildest so your focus is on the video and not on the interface: Options -> Preferences -> Interface -> Interface (tab). I have mine set to Basic GUI with the Tango Icon set. 3) If you keep YT videos running in the background while you work (like me), DON’T USE SMP’s YouTube Browser ESPECIALLY if you have it installed on an SSD. SMP’s YT Browser caches the videos on disk so you are burning through write cycles like crazy and prematurely wearing out your drive. Instead open SMP, ctrl+L to open the playlist, and copypasta all the urls of videos you want to queue from your browser. Now SMP will stream the videos (buffered in RAM) and you won’t have to constantly interrupt your work flow to browse for new videos every time a video ends. If you just want to do a single video, it’s even simpler. Just ctrl+C the URL, open SMP, ctrl+U, and it will stream your single video. 4) Speaking of playlists – Options -> Preferences -> Playlist. Save copy of playlist on exit is extremely useful with the optional Automatically add files to playlist. Sweet input Sophist. Thanks for the contribution. Love the community around ghacks. Martin it would be great to add a forum to this site so everyone can have input without the limitations of the comments system. Perhaps something like Phoronix where each post has a dedicated forum thread that can be displayed as comments or within the forum itself. I’m not sure this is a good idea, as it separates user content from the article. Thanks for such a thorough write-up to supplement this article. I found it very helpful as well. You say this player caches video, where does it cache it to? I can’t find any temp folders anywhere. As for the cache, I don’t remember. It was at least a year ago when i figured it out but I have a feeling it was in the %appdata% folder. (don’t hold me to this though). If you really want to figure it out for yourself and you have Sandboxie, just install SMPlayer on your system normally, then run YT browser in a sandbox, watch a video, use a folder size utility like TreeSizeFree to map the size of all the sandboxed folders (don’t close TreeSize), watch a few more sandboxed videos through YT Browser, and then run another instance of TreeSize and compare the 2nd report to the 1st. This was the original methodology I used to confirm the caching. Tried VLC, recently a friend recommended SMPlayer to me. But when it comes to the subtitle autosearch function, I ‘d still say 5KPlayer. You know, it’s often the case that I have no luck finding any subtitles with the SMPlayer Windows 10 subtitle search. But when I manually search on the opensubtitles.org website using a web browser, I can find some for a given file. On my small Atom CPU TV-box VLC take 50-60% of the CPU. Switched to SMplayer today and the Q6600 use 2-5% CPU and the little ATOM cpu use 12-15% CPU, lot more reasonable. Somehow I switched to SM instead of VLC, after years of using VLC. Just a few more options, or maybe they’re just easier to find or apply. Anyhow, great player. Along with VLC the only one that can turn up volume to 200% (important for some older or quieter videos and concerts). Nice customization options too. Potplayer can boost the volume like that too, upto 500%, jus gota dig around in the options, enable individual volume control, n raise master volume, to do it. I have been using the portable version forever since it plays everything and requires minimal cpu and video resources. What are the benefits to using the “mpv” multimedia engine compared to the default mplayer, if any? Good stuff here, Martin. I’ve been using SM for years and had no idea that it was possible to loop a segment with A-B markers. That’s very useful! VLC is great too but I hate that it doesn’t remember the position of videos. SMPlayer has been my player of choice for a while now. The one feature that makes it far superior to VLC, for me at least, is that I can enable and disable sound normalization without restarting the player. Is there a way to boost volume in SMPlayer? So far I have not found it yet. Nice simple player so far though I’m liking it. A few tweaks to put volume normalization and always on top buttons in the toolbar and I’m mostly happy. On Linux it’s in Preferences – General – Audio – Volume, I have set Max. Amplification to 250.
got it. I have to switch from system to software mixer before it was available. Boost volume: Options -> Preferences -> General -> Audio (tab) -> Use software volume control, input your desired Max. Amplification to the right, click apply at the bottom of the window. Volume Normalization quick access: right click anywhere in the video play area -> audio -> filters -> Normalization toggle. Not the same as a toolbar button but faster then going into the preferences menu. Always on top quick access: right click anywhere in the video play area -> Video -> stay on top -> pick an option. Again, not the same as a toolbar button but faster then going into the preferences menu. Loves me some SMPlayer. Been using it for 2+ years now. Tried all the rest, including Pot, and SMPlayer is the best, IMO. I tried this player when I was experimenting with Linux because I don’t like VLC. I really liked SMPlayer, but it had a problem playing some videos I had made, whereas VLC (and MPC-BE which I use in Windows) did not. There is nothing more superior. VLC is the biggest crap in existence. Yea, gonna go ahead and agree again with others commenting. Potplayer can do every feature that SMplayer can, and better. You like A-B repeat function? Potplayer does it WAY better with way more options, like moving the A or B set points back or forward 1 sec at a time, can boost the master volume, upto 500%, can adjust the audio to video sync back or forward like vlc can, has all the pan n scan, aspect ratio and zoom options u could want, great subtitles support, easy to use instant time jump keybinds already set by default, left or right arrows for 5 sec jump back/forward, Ctrl + left/right for 30sec, Shift +left/right 60sec, Ctrl+Alt + left/right 300sec, all adjustable to however many secs u want, great playlist functionality. I’ve used pretty much every player there is for Windows over the last 10 years too, loved KMplayer for a long time until it got sold and then loaded with extra crap, tried a few diff ones when moving to a new one, Potplayer the best i’ve ever used, plays everything i can throw at it 99% of the time, if for some odd reason it has a problem playing a file, usually with audio if it has a prob at all, vlc is my backup. Potplayer FTW. Anyone Tried LIGHT ALLOY, I’m using it now, very similar to potplayer, and this one can play anything you throw at it..
Media Player Classic is the best, i stopped using PotPlayer which call home each time you launch it. Just block it in your firewall and bingo, no phone home. PotPlayer is easily best media player around, and by some margin. This “best media player” makes me suspicious sorry. Anyway blocked by the firewall the 3 times it call home or whatever else for any reason i already watched my vid.